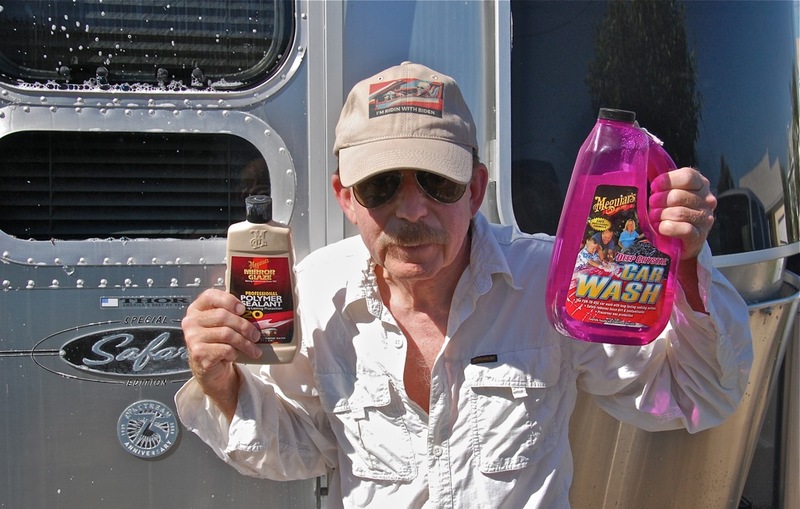 This week I completed our annual wash, wax, and treat (filiform) chores on our 2007 23′ Airstream trailer prior to the beginning of our fall-winter-spring camping season in our wonderful coast, mountain and desert parks in San Diego County. 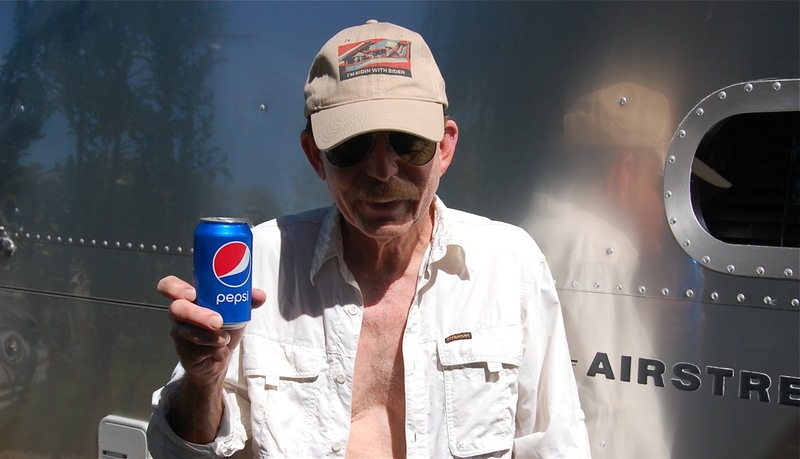 Rich Luhr, in his newly published book, The (nearly) Complete Guide to Airstream Maintenance, says, “Most of the maintenance associated with the aluminum body and clear coat is simple cleaning.” This guidebook includes pertinent “Exterior Cleaning and Appearance” and “Filiform corrosion” sections. 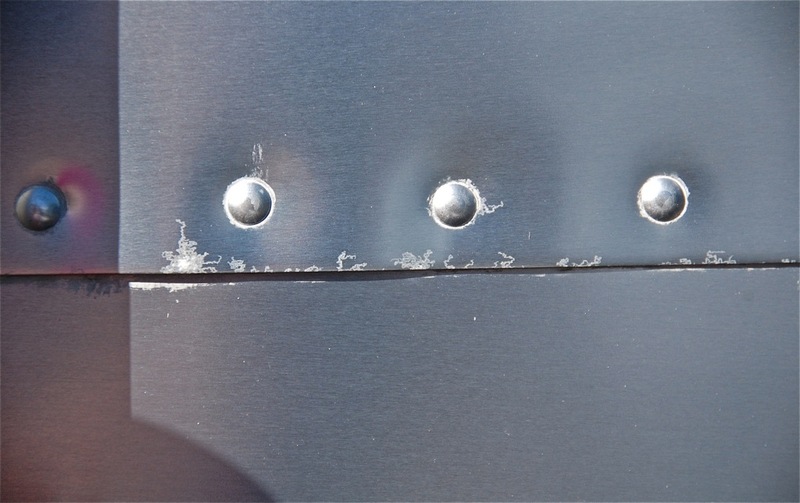 My blog’s web site stats show that my post “Filiform corrosion” gets the most interest and views, which is understandable because many people would like to know how to protect their Airstream trailer. Modern Airstream trailers*, such as ours, have an exterior body of clear coated aluminum sheets that can corrode beginning at the cut edges and rivet holes. Using tools and techniques, such as some of those seen or listed below, I have stopped most filiform and protected our Airstream for the past eight years. Can you spot the filiform in the image below? Yes, it is on right side. Air, water and salts can corrode exposed aluminum and travel as filiform threads under the clear coat finish. (Other white areas shown below are from protective sealant residue.) This filiform has not progressed since 2008 when we started treating with Boeshield T-9* (seen and listed below). Important general note: This article is my report on how I went about washing, waxing and treating my trailer. 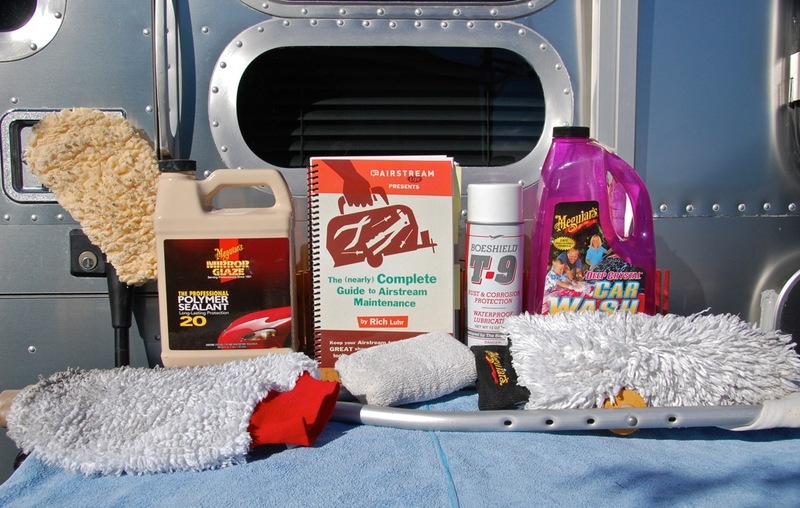 It is not intended to tell readers how to wash, wax, and treat their own trailers. Sun protection for my skin: wide brim hat (except for photo shoot), long sleeve white shirt, long pants, sunglasses, shoes (rubber soles for safety) and sunscreen (Think sport SPF 50+, recommended by EWG). 50-foot garden water hose, 6-foot step ladder, 5-gallon pail, Meguiar’s Deep Crystal Car Wash (label states, it “removes loose dirt and contaminants without stripping wax protection… Dish washing detergents strip wax protection”), extendable car wash brush, vinegar & water (to remove hard water spots), Meguiar’s Mirror Glaze Professional Sealant, Long Lasting Protection #20, (label states, “A unique blend of polymers, resins, silicones and imported waxes… safe for clear coats.”), extendable wax applicator (I used my crutch), cloth-covered waxing sponge, two hand buffing mitts, detergent & water (to clean waxing tools), Boeshield T-9 (label states, “… a combination of solvents, lubricants, and waxes designed for penetration, moisture displacement, lubrication, and protection.”), soda, and a cooler. My strategy: Wash one day and wax the next day to not overwork my 68-year-old muscles and joints. The rest of the trailer was washed from the ground and I removed yellow insect stains with my thumbnail. The trailer was then rinsed off and hard water spots were removed with a chamois moistened in a pail holding 2 1/2 gallons of water and 4 fl. oz. of vinegar. The next day I sprayed Boeshield T-9 to appropriate areas of filiform (It dries quickly.) I topped off my 16 fl. oz. squeeze bottle of Meguiar’s Professional Sealant from my reserve 64 fl. oz. jug (About 12 fl. oz. covers our trailer.) 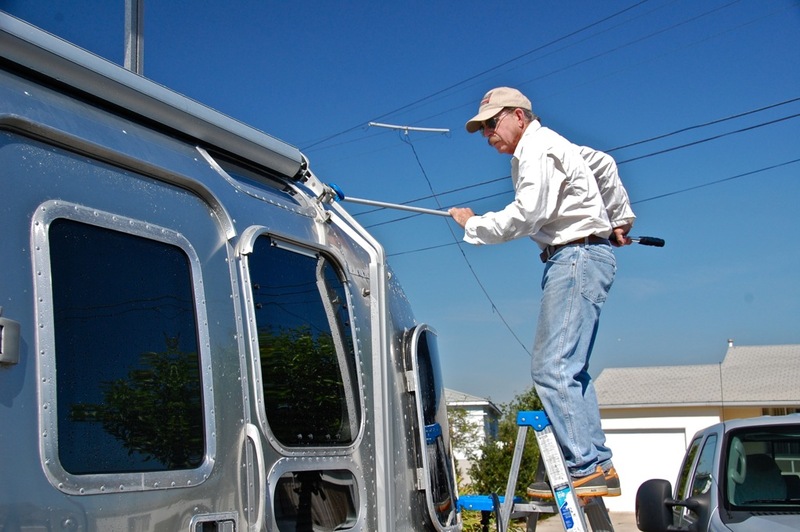 The sealant was applied to the trailer top and AC shroud (I believe it extends the life of the shroud) with an extended wax applicator, while standing on a ladder. I used a sponge wax applicator to apply the sealant to the metal awning cover and the rest of the trailer. The dried white residue was easily removed from the top with an extendable wax-buffing tool and from the sides by using a buffing mitt on each hand. Wax applicators and buffing tools were then washed with a laundry detergent, rinsed, and hung to dry. 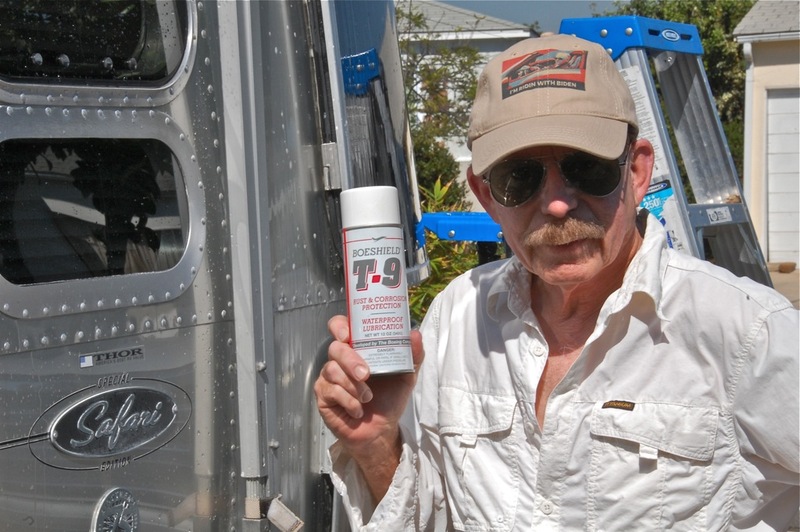 The benefits: From my experience, this sealant will last at least a year and the trailer will only need an occasional rinsing or light washing, especially after camping at the beach (to remove salt deposits), and the trailer will be protected.